So, this review probably won’t be that long, it will probably be one of my shorter posts for two reasons. 1) It’s an ARC (an Advanced Reader’s Copy) and the book hasn’t officially been released out into the wilds yet lol (the release date is set for September 11, 2018) and I don’t want to give away too much or spoil any of it for you. And 2), the book itself isn’t that long at all! The ARC ended at 178 pages! Which isn’t very long at all! So, this definitely made for a quick read and I know some people could read this in one sitting. 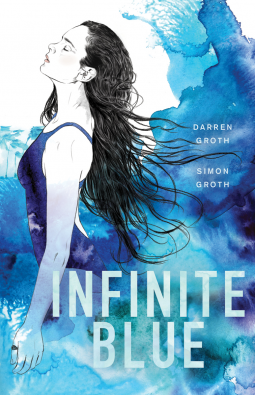 I won this book, Infinite Blue by Darren Groth and Simon Groth, in one of LibraryThing’s Early Reviewers Giveaways which I was excited about because I was drawn to the cover and it sounded like an interesting book that’d be right up my alley. (Summary from back of the book): Ashley Drummond is an elite swimmer. Clayton Sandalford is a talented artist. From the moment of their first meeting, they were destined to be together. Infinite Blue is a contemporary fairy tale about love and loss, flesh and water, the source of eternity, the lure of possibility and the belief that life is limitless when it’s immersed in legend. This was a nice quick read and I enjoyed seeing where this story went. I really liked Clay’s grandmother, she was really amusing and I got a kick out of her and some of the things she said. Ash’s mom definitely got on my nerves because she was so stubborn and she was the type of person that just wouldn’t let things go. Honestly, though, the only complaint I really had about this book was that it was just so short! I would’ve loved to read more and see things a little more fleshed out. I still liked this book, it just left me wanting more. There are a few things that I’d like to mention and talk about with you, but I can’t without spoiling the plot, so maybe I’ll write a more detailed post later once it’s officially released or maybe we can discuss it more in the comments! Are you interested in this book? Let me know down below! Happy Reading and don’t forget to Do What You Love!